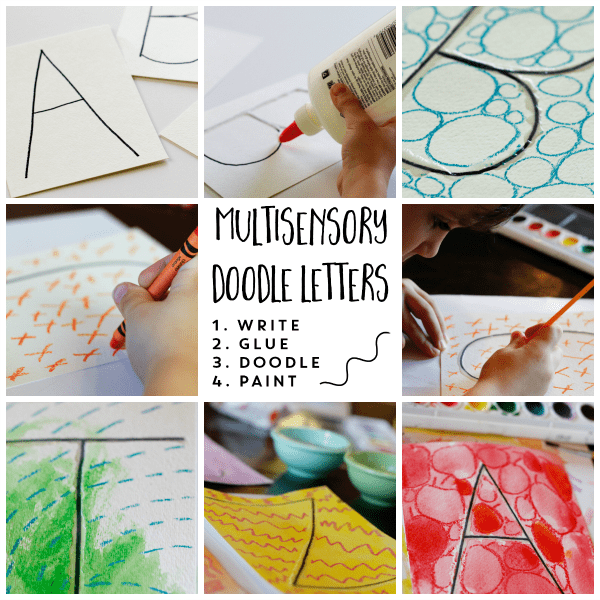 Erin from Home Literacy Blueprint joins our ABCs and 123s letter and math series today with a touchy-feely, multisensory way to learn the alphabet with doodle letters. 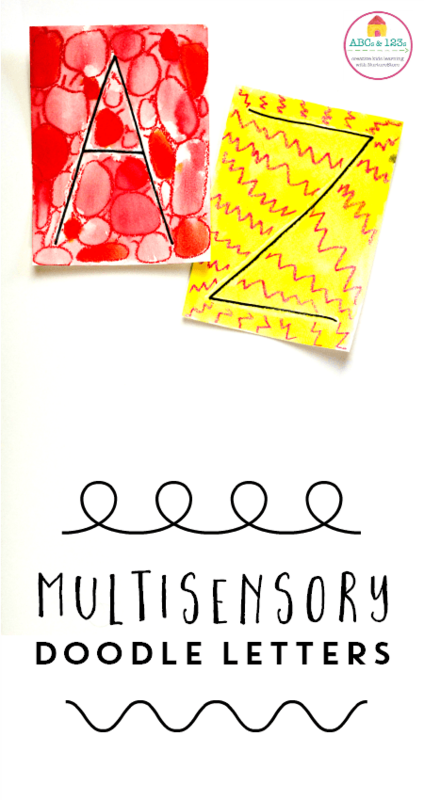 For young children learning their letters, multisensory activities are the best! When we engage our senses, we learn easier and retain information better. Sprinkle in some creativity to spark learning connections, build motivation, and strengthen visual thinking skills. 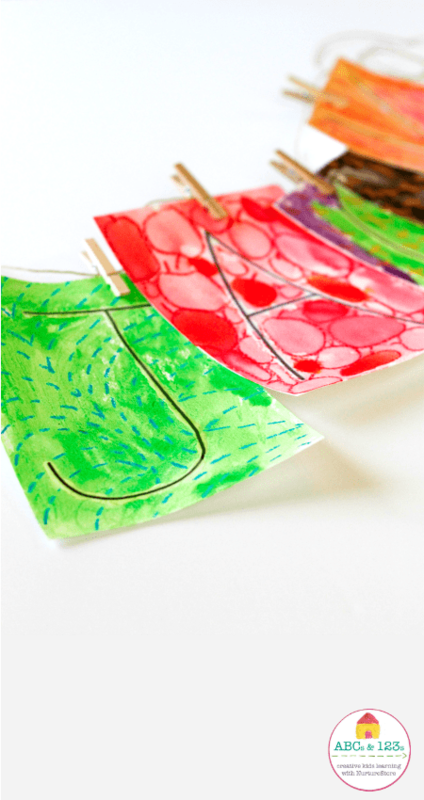 Make multisensory doodle letters for a simple and fun way to combine tactile learning and creativity. This approach can be used to practice letter or number formation, to learn to spell names, or even to practice sight words or tricky spelling words later on. This is a two-part activity. You’ll begin by making the letter with glue and letting the glue dry. Then you’ll follow up with the creative doodling portion. Depending on the amount and thickness of the glue, it can take up to 24 hours for the glue to dry before you doodle. Write a letter on the paper using black waterproof marker. Apply glue over the top of your letter. (Use glue in a squeeze bottle to trace your letter.) Depending on the age of your child, you may want to do this part together. Trace the letter with your finger. It should feel smooth where the glue has dried. Now that your glue is dry, it’s time to decorate. Use crayons to add doodles all around your letter. Fill the page with lines, shapes and doodles. 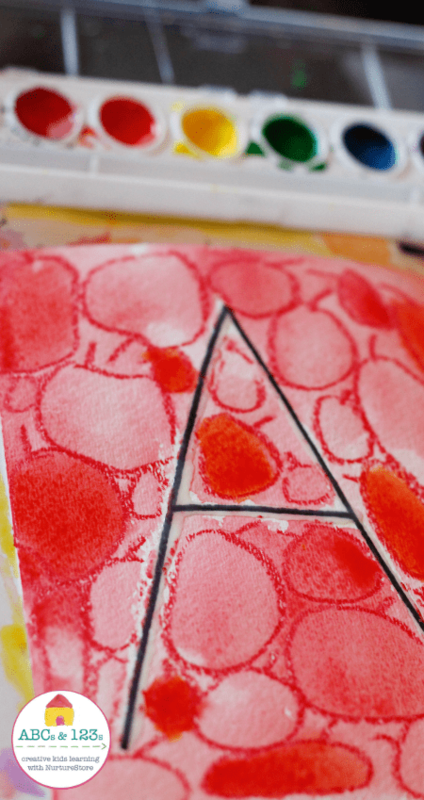 You can draw items that start with the letter, like apples for the letter A, or just decorate the papers with all sorts of shapes, patterns, or doodles. Encourage your child to make the doodles bump right up to the letter, noticing the shape of the letter while they work. Paint over the whole letter card with watercolor paint. The glue and the crayons will resist the paint so the letter and doodles will show through. As your child doodles, you might want to chat about the shape of the letters. Doodle Spelling – A similar doodling activity for older kids who are learning to spell. Playdough and Literacy – Playdough is not just for preschoolers! Learn lots of multisensory ways to incorporate playdough into your literacy routine at home or at school. Smart Spelling Practice for Visual Learners – Six multisensory spelling practice ideas for kids who learn best with color, movement, and creativity. Visit Erin Wing at Home Literacy Blueprint, where she writes simple tips to help families incorporate literacy into everyday routines at home. You can also find her on Teachers Pay Teachers, where she shares resources for creative literacy learning, and communication tools to help classroom teachers build strong partnerships with parents. Previous article: Jasper Johns numbers: a STEAM activity for kidsNext article: Earth day activities: grow a meadow indoors!